It feels like immigration concerns are constantly being discussed on the news these days. For green card holders or those still working their way through the U.S. immigration process, this can lead to a lot of uncertainty and worry. Yes, there are a lot of steps to go through before reaching naturalization. We won’t say it’s worry-free, but don’t let the process cause you undue concern about being deported. Here’s what you need to know about why deportation happens, and what you can do if you receive a deportation notice. A visa or green card gives the holder the right to be in the United States, usually with a specified time limit for visa holders. However, there are several rules about conduct that can result in the visa or green card holder being deported from the country. The full list is extensive, so we’ll break it down to the main categories. Not all crimes are deportable offenses; however, committing a crime is one of the most common reasons for deportation. Offenses like murder, drug or firearm crimes, domestic violence or family violence, human trafficking, and other crimes of “moral turpitude” are crimes that can see the offender jailed — and will very likely mean deportation after release from jail/prison. In addition, crimes against the nation, including crimes related to espionage or terrorism, are also grounds for deportation. This subset of offenses generally covers going against the terms of your visa or green card, as well as not having a lawful entry into the country. This means being in the U.S. unlawfully, which includes staying longer than your visa allows and not having legal documentation when being admitted into the country. It also includes violating your status — getting a full-time job when on a student visa, and so on. This subset also includes fraudulent claims, like falsely claiming to be a U.S. citizen or entering on a visa for unmarried children of a lawful permanent resident when you are, in fact, married. In addition to violating the terms of your visa or green card, it is also possible to be deported for immigration fraud or misstatements on your paperwork. One common reason is applying for a green card because of marriage to a U.S. citizen if the marriage is found to be false. The first step to being deported is a Notice To Appear. This notice calls you to appear before an immigration judge, at which point you’ll be told why you were ordered to appear and which law or immigration violation you allegedly committed. 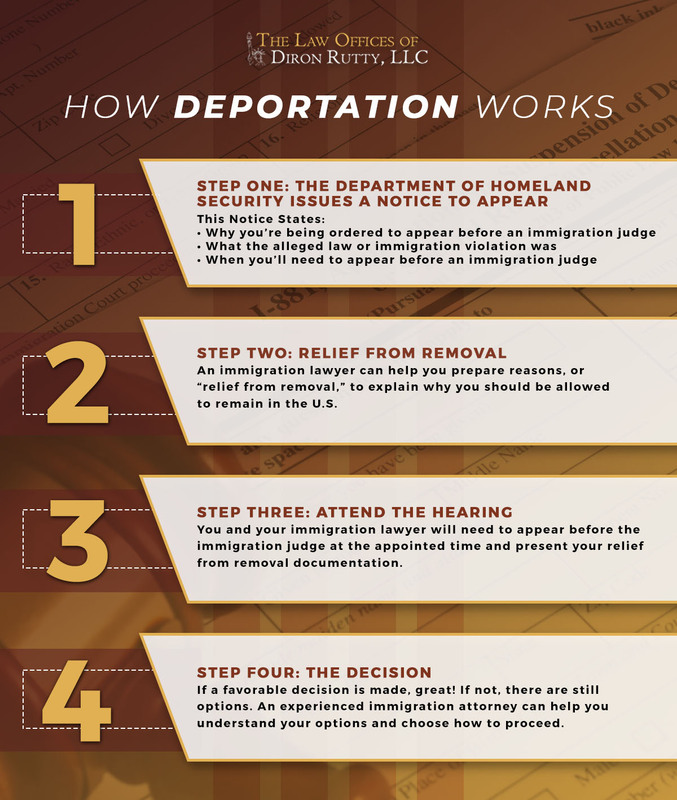 You are allowed help through the deportation process! An immigration lawyer can provide the experience and knowledge to help you respond to the alleged reason for deportation as well as to navigate the process of appearing at your immigration hearing. No matter where you are in the immigration process, even if you’ve received a Notice To Appear, you don’t have to go it alone. 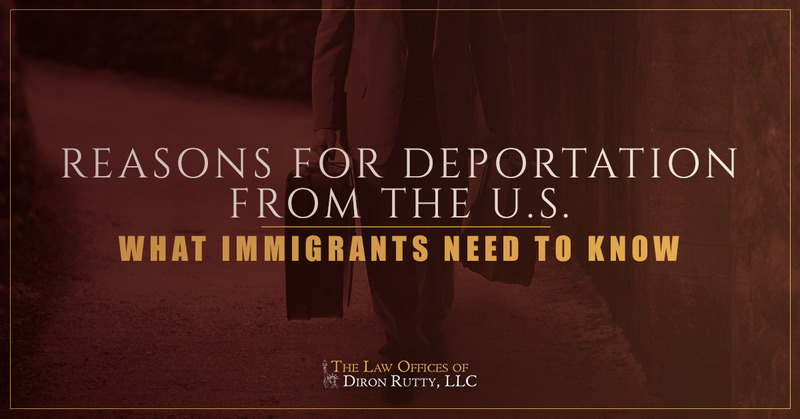 Connect with the immigration attorney at the Law Offices of Diron Rutty, LLC in the Bronx so our years of experience can work for you.